Yuet Wah Hui Seafood is one of many eating establishments in China that looks somewhat non-descript and almost tawdry, but that serves amazingly well cooked food that is faithful to original Chinese recipes. In fact, I can’t take credit for having made this dinner the subject of this week’s Vinous Table, as I was simply following the advice of Chinese friends who have lived in Hong Kong all their lives. And, looking around, I think I might have been the only foreigner in the place that night, which was probably just as well, and also a guarantee of likely authentic Oriental recipes and cooking. Of course, the presence of my friends was essential when it came time to order, as everyone at the table was handed a menu with no recognizable western idioms (but there were plenty of pretty photos). No matter, my friends chose the food, while I took care of the wine. We all had a great time. 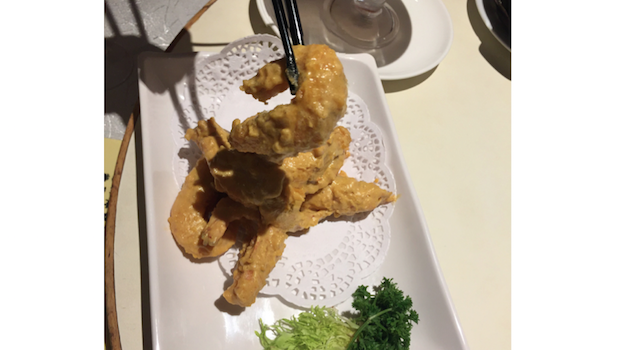 What I like best about the Yuet Wah Hui Seafood restaurant is that it serves excellent but inexpensive Chinese seafood dishes, most of which are clearly Cantonese in origin. Crab is everywhere on the menu, and it is sold by kilo (so I suppose a particularly large and heavy crab may make the bill creep up somewhat, but prices are still quite reasonable.). Oysters are fresh and juicy, and are offered both nature (in this case with a scallion and ginger sauce) as well as deep-fried (quite good, actually). 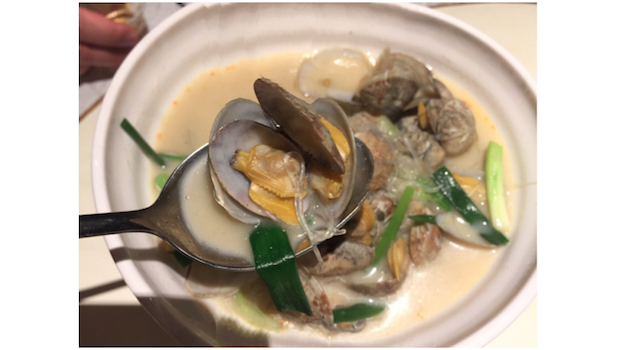 Stir-fried mussels, seafood congee, clams in a peppery but balanced broth, prawns, garlic ribs and crispy tofu are all excellent. In fact, Yuet Wah Hui Seafood allows guests to bring their own wines, with only a modest corkage fee to take into account. On this particular evening, things start off well with the bright and zesty 2006 Perrier-Jouët Champagne Belle Époque, which is vibrant and clean, with lovely floral persistence. The 2003 Dom Pérignon Rosé is a work of art, considering the hotter-than-hot growing season. This beauty exudes ripe strawberry and orange peel notes that are still fresh and vibrant though noticeably creamier than usual. 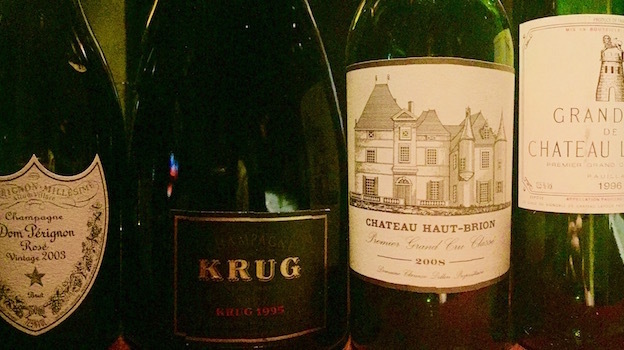 The best bubbly on the evening is the 1995 Krug Vintage, which is drinking beautifully right now and offers plenty of zesty citrus zip and truffly aromatic spice and orchard fruit aromas and flavors. One of my favorite recent vintages of Bordeaux reds is 2008, an often unheralded year that gave wines of great classicism and purity. The 2008 Château Haut-Brion is a case in point, with Haut-Brion’s textbook creamy mouthfeel and ripe Merlot fruit somewhat under wraps thanks to a cooler growing season that was saved by a beautiful fall. Though there’s no rush to pull the cork anytime soon, this beauty is drinking surprisingly well already. 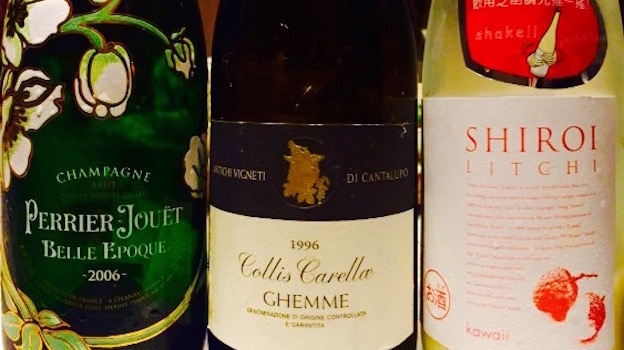 The 1996 Cantalupo Ghemme Colli Carellae is a traditionally made wine from one of my favorite producers of northern Piedmont Nebbiolo. Although it lacks the structure and sweetness of Barolos or Barbarescos, this Ghemme delivers very pure cool-climate Nebbiolo aromas and flavors, nicely extended by noteworthy acidity and framed by relatively smooth tannins. Our last wine of the night os the usually dependable 1996 Château Latour, which is very Pauillac-esque in its firm, penetrating structure and long persistence of cigar box, graphite and blackcurrant aromas and flavors. The Chugoku Jozo Kawaii Shiroi Litchi liqueur, a generous gift of one of my friends, is made with lychees produced in Taiwan which I am told have a distinctively fruity, almost pungent flavor that is attenuated only slightly by the milk in the liqueur. Shiroi means "white" in Japanese, and the Kawaii Shiroi series includes three white and milky liqueurs made of lychee, Chardonnay grape and La France pears (the three liqueurs are therefore a mix of raw milk and fruit juices). I found this specific liqueur enjoyable in very small doses and with plenty of ice, but also extremely sweet and cloying when taken in larger sips. 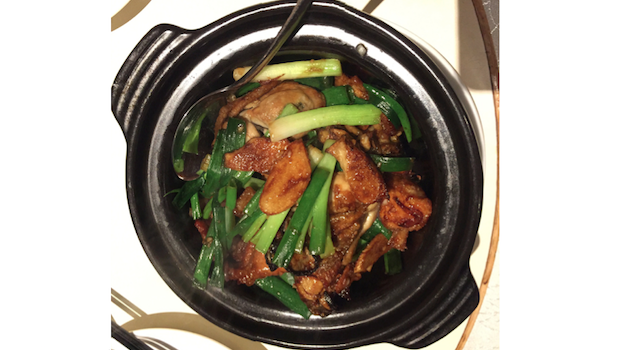 Overall, I enjoyed my evening at Yuet Wah Hui Seafood. Although the décor is nothing to write home about (very basic, with bright, fluorescent lights and simply adorned rooms), the food is robust and savory. Everything seems to magically come together on the night, leaving me walking back to my hotel or home feeling happy and satiated.